Meabco A/S in a privately held biotechnology company established in 2001 researching into breakthrough cancer therapy with the vision to create new effective cancer therapy options with low toxicity. The company has licensed all rights to two potential breakthrough cancer products which could significantly change the way cancer is being treated today. 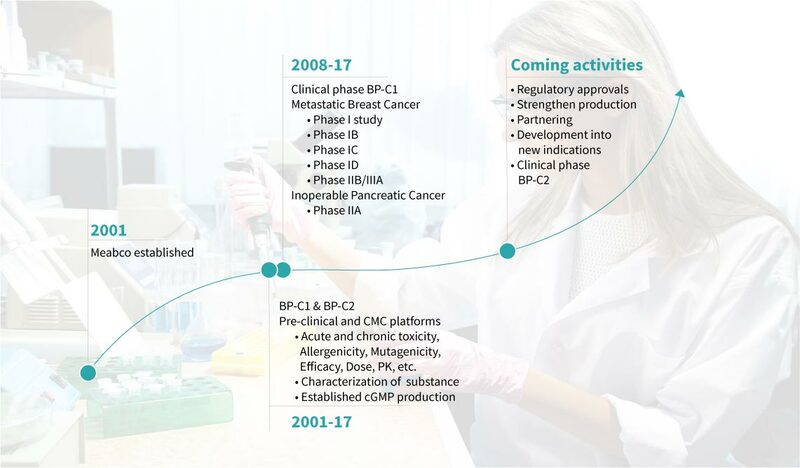 We are seeking to commercialize these products over the coming years as clinical research, physician experience and product registrations develops. Meabco A/S is managed from Copenhagen with a professional Board of Directors. Strategic cGMP production sites are located in Switzerland and Belgium ready to expand capacity as commercialization is initiated.